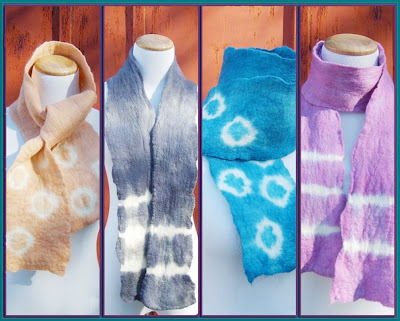 The Funky Felter: New Handmade Tie Dye Felted Wool Scarves! And a little craft show reminder too . . .
New Handmade Tie Dye Felted Wool Scarves! And a little craft show reminder too . . . I just wanted to share my latest ties dye creations. I am having a lot of fun felting basic white merino scarves then dyeing them in a kettle. I use rubber bands and marbles to create the stripes and dot patterns. I'd like to also use a needle and thread to stitch some patterns into the scarves before dyeing them, but that will take a little more time to do. There is an instant gratification when just using the rubber band method. It is quick and pretty easy to tie dye this way. It takes a little longer to make the hand felted wool scarves though. I will be listing this new tie dye collection of scarves for sale in my Etsy shop this week and next week, and I'll probably be making more soon. You can also see more photos of them in my flickr photo gallery. If you have any good color suggestions for my next batch of tie dye scarves, please do leave a comment! I really like most of the colors so far, but your opinions are greatly appreciated. Also, I wanted to remind you that I will be selling my wares at a craft show coming up on this Saturday, November 22nd. If you are going to be in the Kansas City area, please stop by the Christmas for a Cure Holiday Open House and say "hello!" You will find several artists and crafters with their uniquely handmade items for sale. It is a good time to Christmas and Holiday shop! Click here for time and location information. And, since I will doing a show on Saturday, this also means that I will be taking down some of my shop listings for that day. If the item sells at the show, it will be gone. If you've had your eye on a scarf, purse, or otherwise one-of-a-kind item, I suggest that you think about making a purchase before Friday late afternoon when I take the listings down until Monday. Oh, and one more little thing - today, November 20th, is my 32nd Birthday!! No, I am not (yet) ashamed to say my age. My thirties have been very good to me so far . . . I am thankful for all the years that I've had and look forward to many more years if that is what God has in store for me. thanks for stopping by my blog, shalana... and for the nice comments. also, happy birthday!